On the Pine Ridge Reservation, Henry Red Cloud is trying to create a renewable energy economy from the ground up. 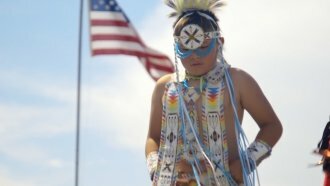 Henry Red Cloud is creating a grass roots solar movement for native peoples. "As natives, we embrace renewable energy," he said. "It's in our language, our song, our dance, our ceremonies. Renewable energy can help families to have lights for the first time and then have running water — all of the necessities that we take, if we do have it, we take for granted." He and the Red Cloud Renewable Energy Center train students how to capture and use solar energy. Those students then take that solar know-how back to their reservations and their homes nationwide. "We've been operating since 2006, so 11 years with pretty close to 1,000 students coming through our program, and 42 of the greater northern plain tribes," Red Cloud said. On the Pine Ridge Reservation, where Red Cloud lives, about half of the residents live in poverty. Utility bills are often as high as $600 each month. "We're gonna learn this new way of honoring that old way and then becoming sustainable," he said, "starting to create our own economies, creating a small business, putting some people to work."